We sit down with one of the site’s YouTube content creators, Achromatic! Daily Exposé is a series of articles in which we interview creators of all sorts of Pokémon related content from the PokéCommunity forums and the rest of the Internet. In this installment, we shall be having a one-on-one with a contributor of the PokéCommunity YouTube channel, Achromatic. Achromatic has been an active member of the site since 2009, and is currently serving not only as a member of the site’s YouTube channel but also a moderator of the site’s Pokémon Gaming Central forum. Tell us more about the PC YouTube channel. What kind of content can we typically expect from the channel? Besides yourself, who are some of the other content creators that frequently assist you with the running of the channel? 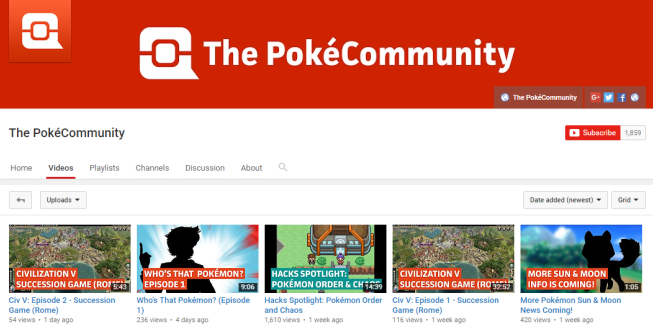 The channel is obviously named after the site, PokéCommunity. Are there ways that you engage and incorporate the “community” aspect of the site within your channel? Yep! As I mentioned above, users can submit their own content to the channel. Even if you aren’t able to make a video, we’re more than happy to listen to any ideas that anyone might have for the channel’s content. For our readers out there who may not know, how exactly is the channel integrated with the site? How is it connected? The channel revolves around making content that is relevant to the community and can actively engage with you guys. We’ve hosted events for videos in forums before such as Video Games, PGC and more to help integrate it fully with PC and I think that’s worked out very well. What would you say has been the biggest goal of the PokéCommunity channel thus far? Showing off how great the site and people here are! There’s an incredible amount of talented people around PC, and we’re very eager to showcase that with the channel. I’d say that has been a pretty big goal of ours. Would you say you’ve been able to achieve those goals highlighted? Definitely! We’ve gotten original songs submitted, art videos and even collaborated on a video with a user too. A new segment that appears at the end of our videos also highlights user’s art here on PC, so there’s plenty of ways to get your talents showcased. With such a saturated video game news market, whether that may be in terms of streamers, Let’s Players, or news channels on YouTube, what makes the PokéCommunity channel stand out from the rest? Why should a reader check out this channel? Rather than the same old we try our hardest to make our content as original as possible. I love working with the team (and PC in general) to think up ideas that people have never really tried before on YouTube, or at least not in the way we have planned out. We definitely wanna keep it fresh. With the announcement of Pokémon Sun and Moon recently, what can we expect from the channel in terms of content centered around that? What would you say has been the biggest accomplishment so far by the channel? Hitting 1000 subscribers was amazing. The channel really grew fast and we’re happy to see it become an established part of PC. It’s only up from here. Have any projects in the works that we may get a hint about? Definitely! Soon we’ll be taking a look at the current Hack of the Month, Gary’s Mod. We also plan to take a look at a newly released fangame known as Shadowstone. In terms of Sun & Moon content, we’re getting out a discussion regarding the new region (and a few other things) within the week! Stay tuned. If a reader would like to submit content or ideas for the channel, where might they be able to do that? When submitting feedback and ideas they can go here, and to submit content they can go here. Thank you for your time Achromatic, and may the YouTube channel have continued success! Edited by Aurora and bobandbill.